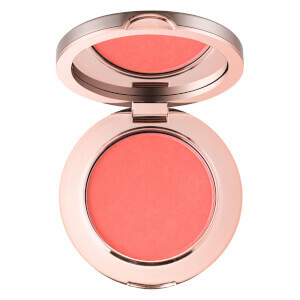 The Colour Blush Compact Powder Blusher from delilah creates an instant flush of colour to brighten and lift any skin tone with a soft, rosy glow. The ultra-lightweight powder features refined, micronised pigments that seamlessly blend onto skin with colour-true coverage, while subtly blurring the look of imperfections. Housed in a chic, mirrored compact with protective velvet pouch, ideal for keeping in your handbag for on-the-go. Talc, Zea Mays Starch, Dimethicone, Mica, Zinc Stearate, Triethylhexanoin, Magnesium Myristate, Cyclopentasiloxane, Phenoxyethanol, Caprylyl Glycol, Sorbic Acid, Cyclohexasiloxane, Disodium EDTA, +, CI 77491, CI 77492, CI 77499, CI 77007, CI 15850, CI 19140, CI 45410, CI 45380, CI 77891.